Coming in for a landing and trying to avoid the rows of vines. I slipped on some shoes and stepped outside to be greeted by the sight of a tremendous, blue and yellow hot air balloon drifting toward our house about 20 feet above the vines. The “whoosh” noise was the sound of the gas burners used to keep the balloon aloft. As a Napa local, I’ve grown accustomed to the sight of ballons hanging high above the Napa Valley, but this was the first time I had the experience of seeing one so close and headed right for me. 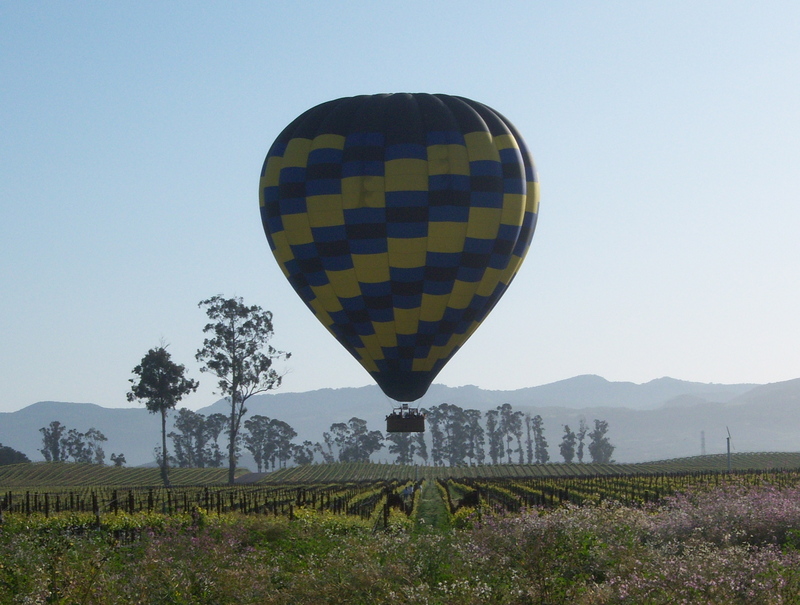 Hot air ballons are a more common sight upvalley in St. Helena and Youtville rather than in Carneros. And as it turned out, this particular hot air balloon had departed from Yountville but had been carried down to Carneros on fickle winds. The yelling had been from the balloon support staff who had arrived at the house in advance of their craft. After getting permission to land in the back field, the staff quickly and loudly began coordinating with the balloon operator (ballonist? pilot? hot air aviator?) to get the cumbersome craft on the ground. It took about 20 minutes, but the ballon came to a gentle rest among tall bunches of wildflowers and grass. 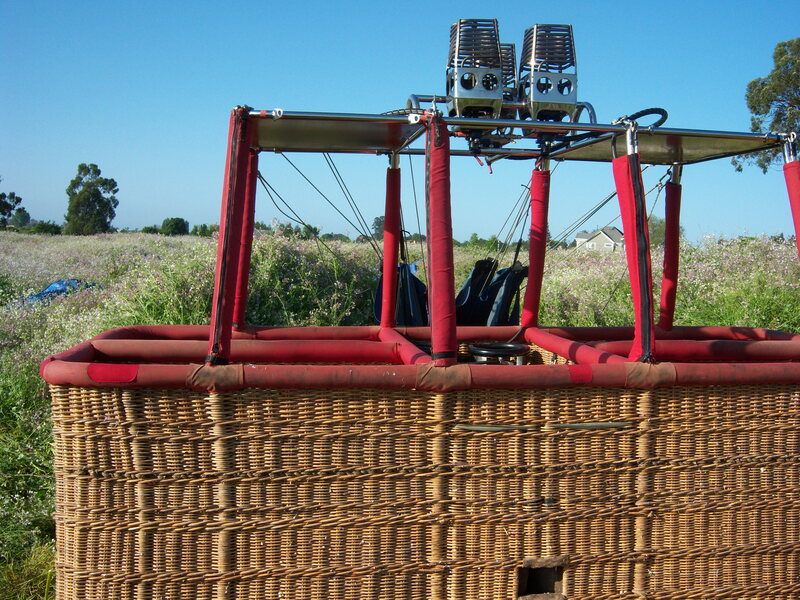 The staff assisted the 15 passengers out of the basket and the balloon boss (I like the ring of that — “What do I do? Why I’m a balloon boss actually.”) thanked us for providing a landing spot. He also tossed us a bottle of Chandon sparkling wine. 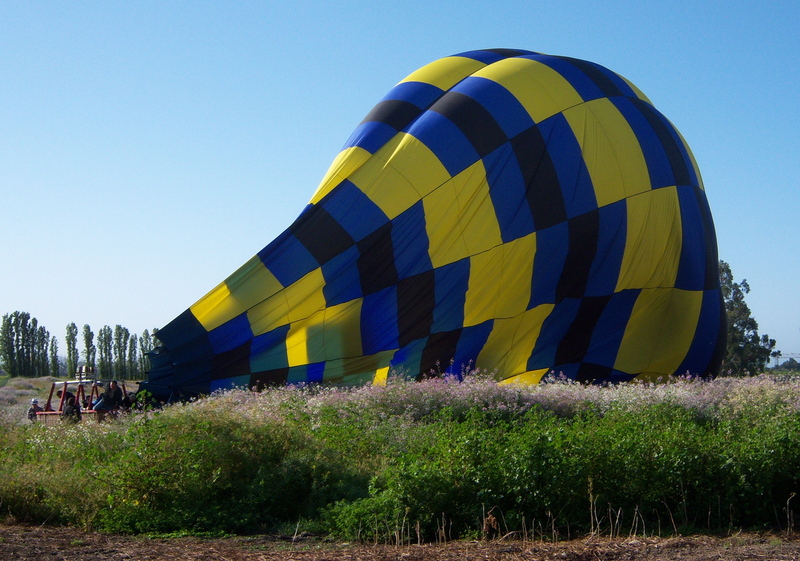 After the landing, the next job is rolling the balloon up. When I was able to take a look at the balloon, I was surprised by how many people they can cram into the relatively small balloon basket. It appeared that on a balloon ride you’re shoulder to shoulder with the other passengers, like on a ride on a MUNI commuter bus. I thought I might get a little claustraphobic, but perhaps the sweeping vistas of the Napa Valley make one forget about the tight proximity of the fellow balloon adventurers. A ride on a balloon costs about $100. The whole experience took about 45 minutes, but it sure was an interesting and different start to a Sunday.